Finding the best way to get around a busy city is no easy task. Unless you know the place like the back of your hand, choosing between cars, public transport, bike and even scooter shares can be a daunting prospect – but IBM's Watson might be able to help. At MWC 2019, Seat and IBM announced Mobility Advisor, which uses Watson artificial intelligence (AI) to work out the best way to reach your destination – whether it's a train, ride-hailing service or an electric scooter. The tool's suggestions will take into account traffic reports, weather forecasts, and any events happening in the city that day, so you won't get caught in the rain riding a hire bike, or reach a train station at the same time as a crowd of sports fans. Mobility Advisor is currently in development, and is intended to run as a mobile app on 4G and 5G networks. Over time, it will learn your preferences and make personalized recommendations based on the way you like to travel. 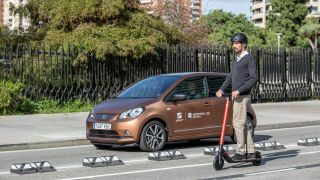 Seat also used MWC to unveil Minimó: a fully electric vehicle that's designed to help take the pressure off congested streets. Minimó's design is part car, part motorcycle – keeping passengers under cover, but small and nimble enough to navigate crowded city centers. Mobility Advisor isn't Watson's first time Watson has hit the road: at CES 2019 in January, IBM demonstrated an autonomous shuttle with the AI 'super assistant' doing the driving. The shuttle had level-four automation, with no steering wheel, brake pedal or accelerator. instead, guests were invited to try getting from A to B within a small test space using voice controls. Passengers were also able to ask simple questions about the weather, but future versions of the system might allow time-pressed city-dwellers to pick Watson's brain for much more advanced queries and get some serious work done while the AI handles the navigation and maneuvering.